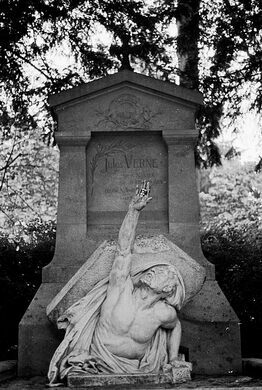 Famed science fiction author Jules Verne died from diabetes at the age of 77 on March 24, 1905, in Amiens, France, where he was buried in the Cimetière de la Madeleine. 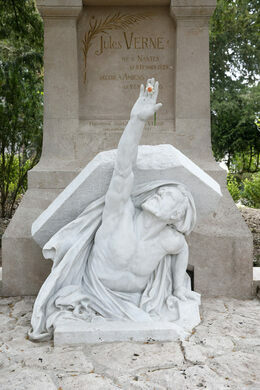 Two years after his death a sculpture entitled “Vers l’Immortalité et l’Eternelle Jeunesse” (“Towards Immortality and Eternal Youth”) was erected atop his marker. 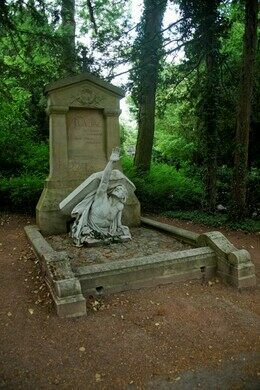 Designed by sculptor Albert Roze and using the actual death mask of the writer, the statue depicts the shrouded figure of Jules Verne breaking his own tombstone and emerging from the grave. The effigy has become iconic enough that in first issue of seminal science fiction magazine Amazing Stories (first published in 1926) and for many years thereafter a drawing of his tombstone appeared as part of the masthead. Given the author’s undeniable influence on almost all genre fiction even today, Jules Verne’s Tomb is still a popular pilgrimage site for adventurous geeks.